A hand made kitchen will not only add value to your home It is aesthetically pleasing and easy on the eye, practical and will last for years. 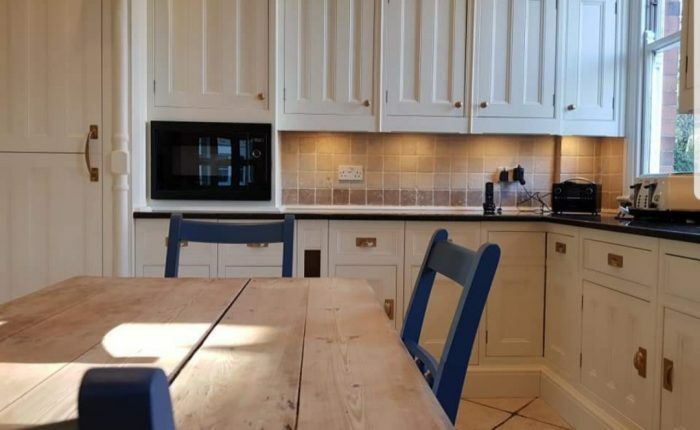 We hand paint, hand made kitchens direct from the manufacture or we can refurbish your existing kitchen for a fraction of the cost in replacement. Hand made kitchens direct are a company that manufacture, bespoke kitchens at very competitive prices. This is a kitchen we recently hand painted for a client in Slaithwaite, Huddersfield. Which was purchased from Hand Made Kitchens Direct. As a specialist kitchen painting company, we are currently noticing a lot of enquiries for hand painting these particular kitchens. They are very cost effective in comparison to the usual big names of kitchen manufactures… well constructed from Tulip wood and MDF (medium density fibreboard) and paint up lovely! The clients did a lot of research and took inspiration from various kitchen layouts and colour schemes they had found on the internet. They also employed the services of an experienced carpenter/kitchen fitter and us of course, to hand paint it. 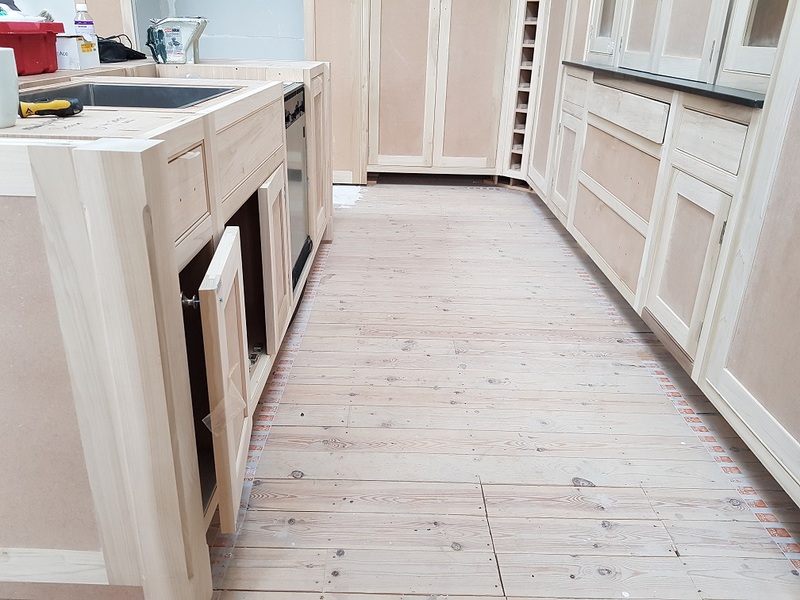 There is a fair bit of work hand-painting a hand made kitchen in bare wood like this; applying the correct primer is key! 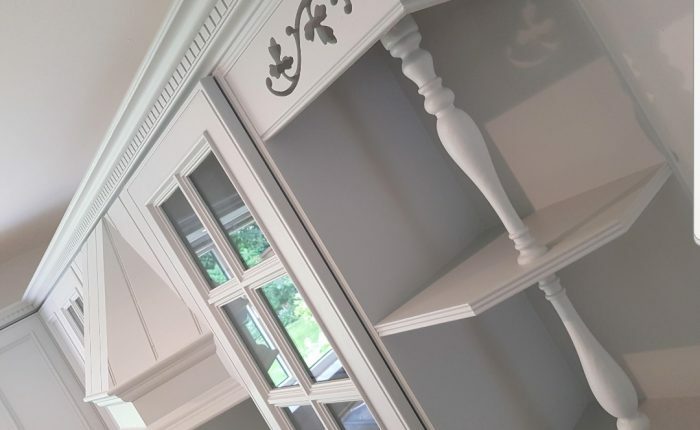 The specialist furniture paints we use will leave a subtle, soft yet durable finish. 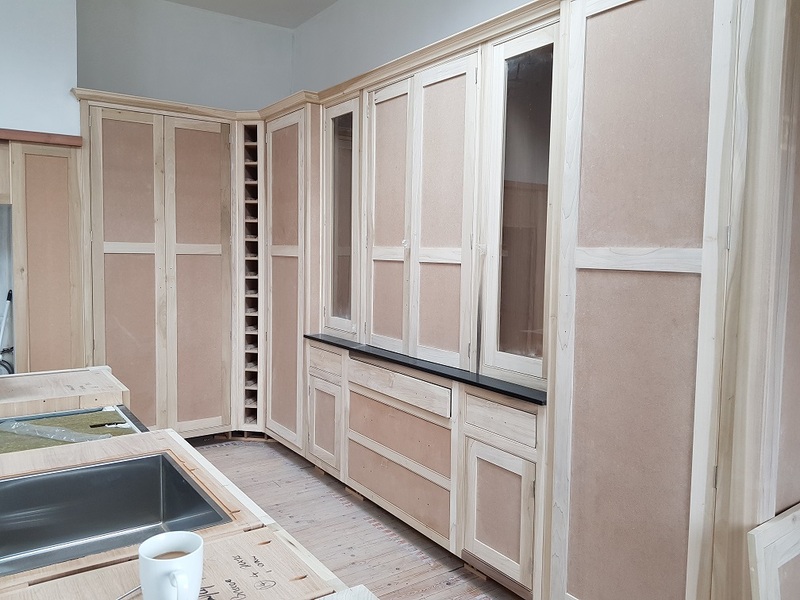 First job on this (in-frame kitchen) is to dismantle all removable items such as doors and draws, so we have full access to the frames and hinge edges to frames and doors. It may seem like a lot of work but the end result is far better as all areas receive the full paint system. The insides of the cupboards will receive to coats of hard wax oil, which the client is going to afterwards to save on costs! 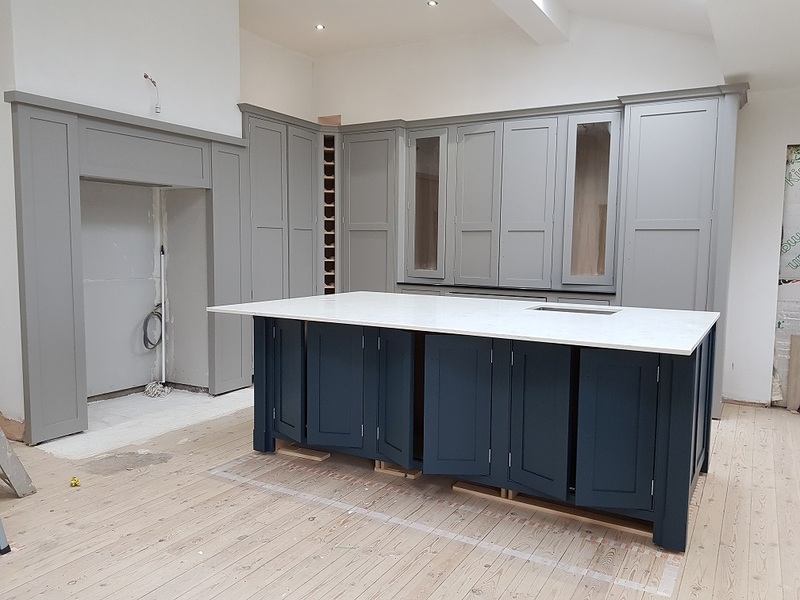 The colour scheme for this kitchen will be a rich deep blue for the focal island units, which was topped of with a slab of white granite with light grey veins. The main run of units will be painted in a mid tone grey. 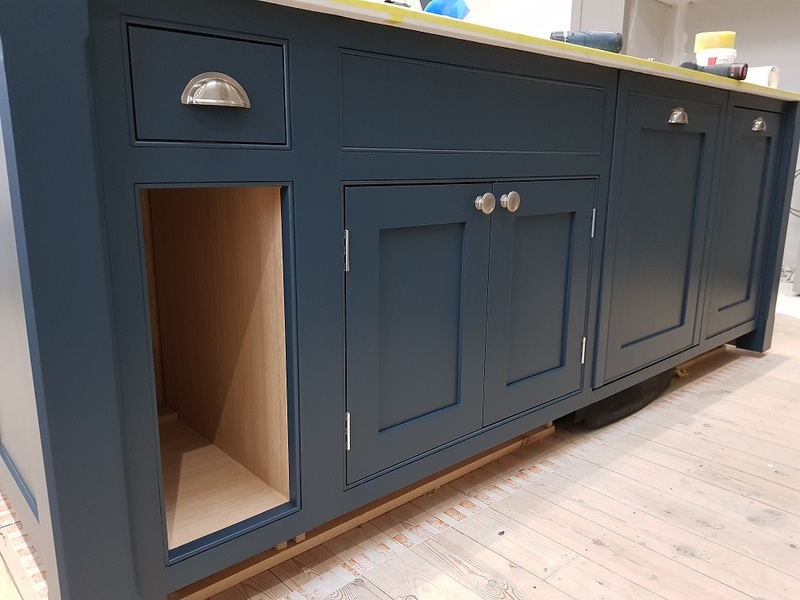 The colours were mixed into a specialist furniture paint and were the equivalent to Farrow & Ball “Hague Blue” for the island and “Worsted” on the main units. At the time of taking these picture this hand made kitchen project was not completely finished. The flooring was yet to be laid and the decoration to the walls completed. Once finished, the client has promised to send me some pictures and I will add them update this post! If you have a project in the pipeline, whether it be a hand made kitchen or you’re considering refurbishing your existing wooden kitchen? Please feel free to Contact Us to discuss your options. We work in and around Nottinghamshire, Derbyshire, South Yorkshire, West Yorkshire and throughout the UK.